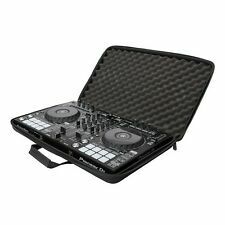 Magma CTRL Case S2 MK3 Protective Carry Bag for NI Traktor Kontrol S2 MKIII. 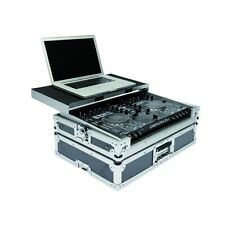 MAGMA DJ Controller Workstation Denon MC-4000 Transport Flight Case. Convenient carrying-handle and option to attach a separate shoulder strap. Constructed from laminated MDF and anodized aluminium profiles and butterfly latches (can be secured with a padlock). Outer: 415 x 630 x 160 mm. Magma CTRL Case XL MK2. Why people choose Bop DJ. WarrantyFull Manufacturer's Warranty. Hard/Soft CaseHard. Magma LP Case 100 SP Black / Silver is the ultimate record crate for travelling vinyl pros. Capacity for 100 records. Inside foam padding for ultimate protection. 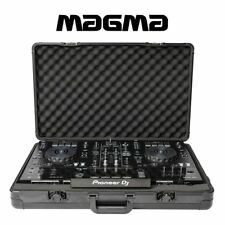 Magma DJ Controller Flight Case for Denon SC-5000 Prime Media Player. Magma CTRL Case - DJM-S9. The new CTRL Case DJM-S9 is custom designed to hold the new Pioneer DJM-S9. Crafted from lightweight and rigid Durashock molded EVA shell it’s a very compact and protective carrying solution that fits easily into the overhead bin or under the seat of most airlines. 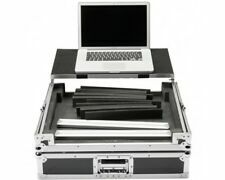 Magma Multi-Format Workstation XXL Fits Many DJ Controllers Heavy Duty Case. The LP-Bag 100 Trolley is a proven practical and convenient transportation solution to carry up to 90 12″ vinyl records. The new reinforced design has been rigorously tested to insure the highest strength and stability to carry your precious records well protected. 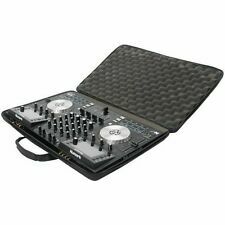 MAGMA DJ Controller Workstation NV Numark Controller Laptop Carry Flight Case. The fully padded main body features a reinforced semi-hard PVC-body, providing excellent protection and a stable fit even in the pre-selected position of the records. Internal size and divider allows two different storage ways. Crafted from 9 mm vinyl laminated plywood, sturdy aluminium profiles and heavy duty butterfly latches, it provides you with secure transport and workstation in one. Holds a Numark NV and Laptop. gliding laptop platform (removable). 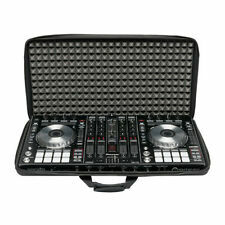 Magma CTRL Case CDJ/Mixer Black Protective Case. Magma CTRL Case - Ableton Push 2. Crafted from durable and lightweight Durashock molded EVA foam and a water- rejecting polyester exterior, it is furthermore equipped with an adjustable (velcro) foam-kit that provides extra protection for all encoders, knobs and buttons. Convenient carrying-handle and option to attach a separate shoulder strap. Outer: 500 x 800 x 160 mm. Fully lined interior of 5 mm EVA foam and a 3 cm thick egg-crate foam on lid. 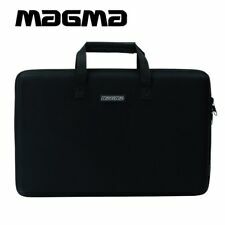 Magma CTRL Case S4 MK3 Protective Carry Bag for NI Traktor Kontrol S4 MKIII. Magma CTRL Case - DDJ-SB / SB2. Designed to Hold Pioneer DDJ-SB / SB2. 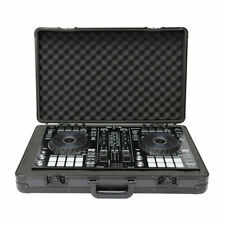 The new CTRL Case DDJ-SR is specially designed to protect the new Pioneer DDJ-SR unit. Crafted from durable and lightweight Durashock molded EVA foam and a water- rejecting polyester exterior. Magma Large DJ Headphone Case Black 41460. Holds any model of DJ or studio headphone (foldable and non-foldable ones). Crafted from durable and lightweight Durashock molded EVA foam, the new Headphone-Case can hold any common foldable and non-foldable DJ or studio headphones. Fits Pioneer DDJ-SB and Pioneer DDJ-SB2. Sound & vision. Sturdy zipper and comfortable carrying handles. Hard/Soft case Hard. Compatible with Decksaver cover. 9am-6pm, Mon-Sat. The new CTRL Case DJM-S9 is custom designed to hold the new Pioneer DJM-S9. Crafted from lightweight and rigid Durashock molded EVA shell it's a very compact and protective carrying solution that fits easily into the overhead bin or under the seat of most airlines. Crafted from 9 mm vinyl laminated plywood, sturdy aluminium profiles and heavy duty butterfly latches, it provides you with secure transport and workstation in one. Hard/Soft case Hard. Secure stacking due to stackable ball corners. 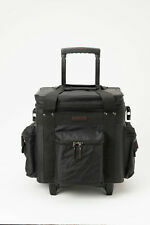 The Magma LP Bag 100 Profi is another proven Magma classic. Quality zipper (water resistant) and padlock to secure the records inside. Stable and comfortable carrying handle and padded shoulder strap (detachable). Sound & vision. Hard/Soft case Hard. Secure stacking due to stackable ball corners. Solid aluminium profiles and spring loaded latches. Heavy duty construction of 9mm vinyl laminated plywood. Holds a Pioneer Pioneer XDJ-RX. Bag of Transport MAGMA RIOT Carry on Trolley.